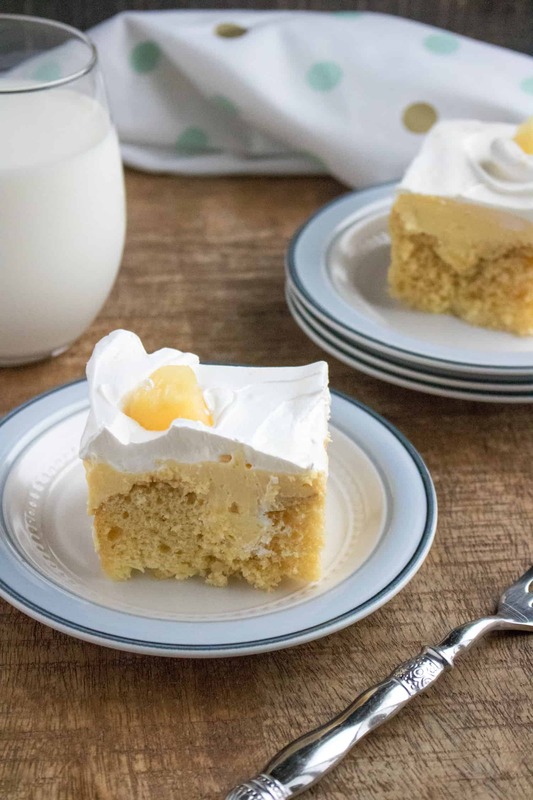 This Pineapple Poke Cake recipe is sweet, moist, and delicious. Even better, it’s super easy to make! Okay, now I know you’ve seen these poke cakes all over the place. If you haven’t tried one yet, you are missing out SO bad. Because they are good. Moist, delicious and oh so yummy. And, did I mention, easy to make? 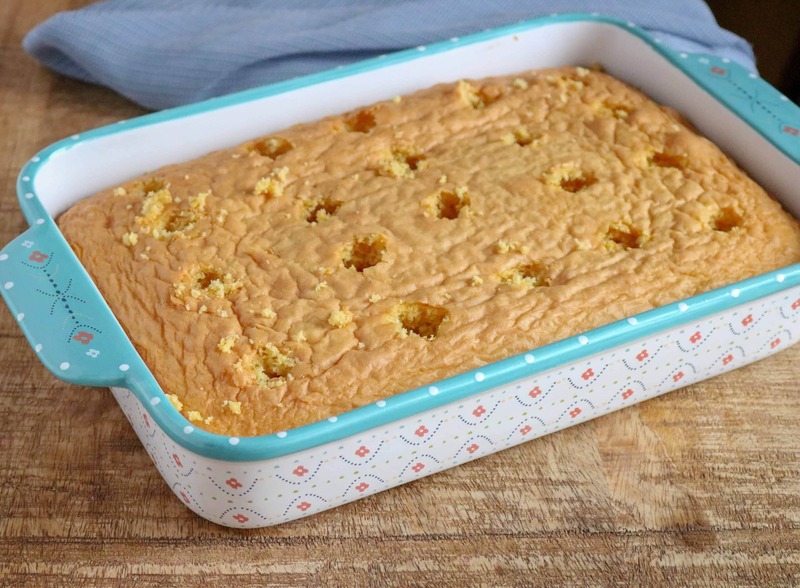 Pineapple Poke Cake – What is a Poke Cake? You might have seen these all over the place, but what is a poke cake? I admit when I first heard about poke cakes, my mind immediately went to poke — aka fish salad. A fish salad cake?! No thank you. Thankfully, I was completely off base about poke cake. It definitely has nothing to do with fish! The “poke” in poke cake actually refers to what you do when you make it. 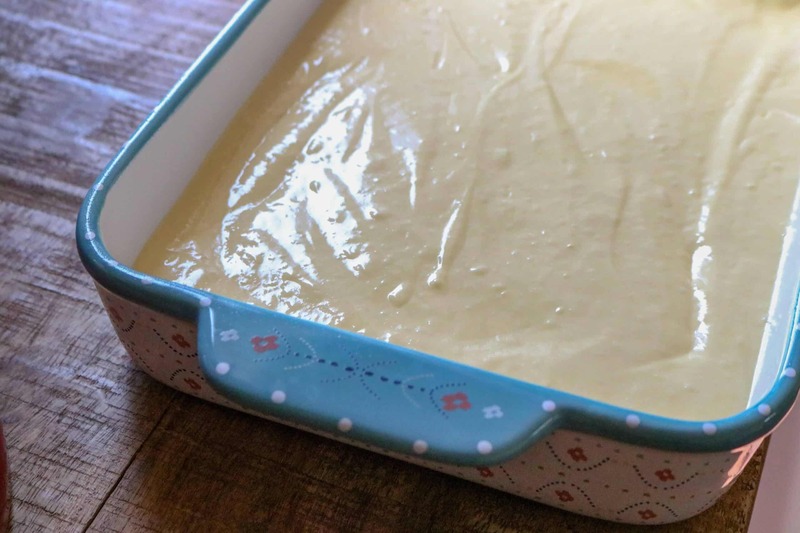 You poke holes in a poke cake after baking it… then add some sort of filling (for Pineapple Poke cake, you add a pudding-whipped cream mixture) or liquid. The filling or liquid flows into the holes and makes each bite full of flavor. Yum! Step #1: Start with a 9×13 pan, lightly sprayed. Layer pineapples in the bottom of the pan. Step #2: Mix the cake batter together and pour over the pineapples. Step #3: (The poke step!) Bake for 34-38 minutes. Remove the cake from the oven and cool. Then, go to town and poke holes all over it. Use a wooden spoon handle. Step #4: Next, spread the pudding mixture over the cake. Decorate with pineapple chunks. Refrigerate for a couple hours and then serve it up. Trust me, this cake is SO good! If you like a moist cake and anything with pudding, then you’ll love this cake. Pineapple Poke Cake rates up there with my fruit pudding… one of those desserts my family could have again and again. 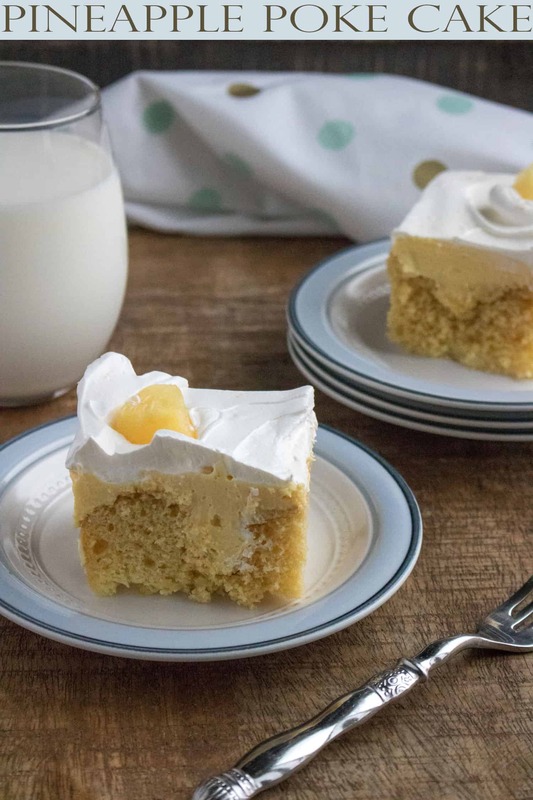 Like Pineapple Poke Cake? Try these! 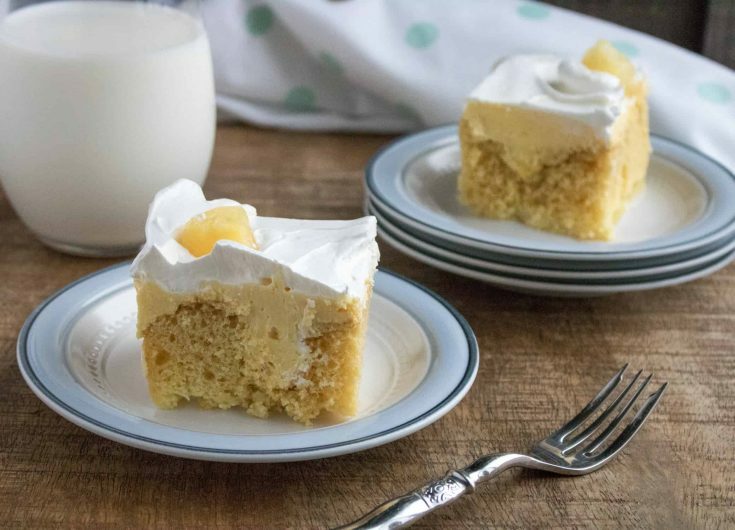 Pineapple Poke Cake is oh so good and so easy to make! Spray a 9x13 pan with cooking spray. Line bottom of 9x13 pan with cake with pineapple slices. Mix cake according to package directions. Spread cake batter over pineapple slices. Bake for 34-38 minutes. Remove from oven. Let cool and then poke holes in the top of the cake with a wooden spoon handle or other utensil. 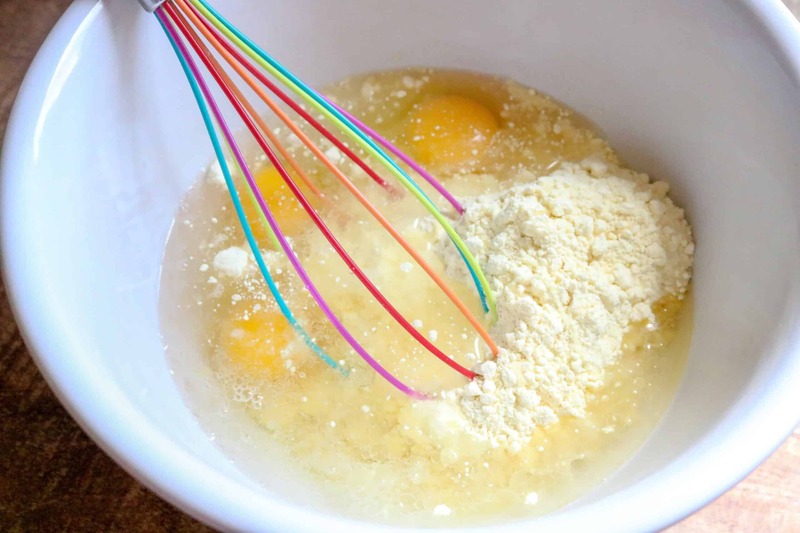 Mix together vanilla pudding mix and milk together and then pour over the cake, spreading it out to fill in the holes. 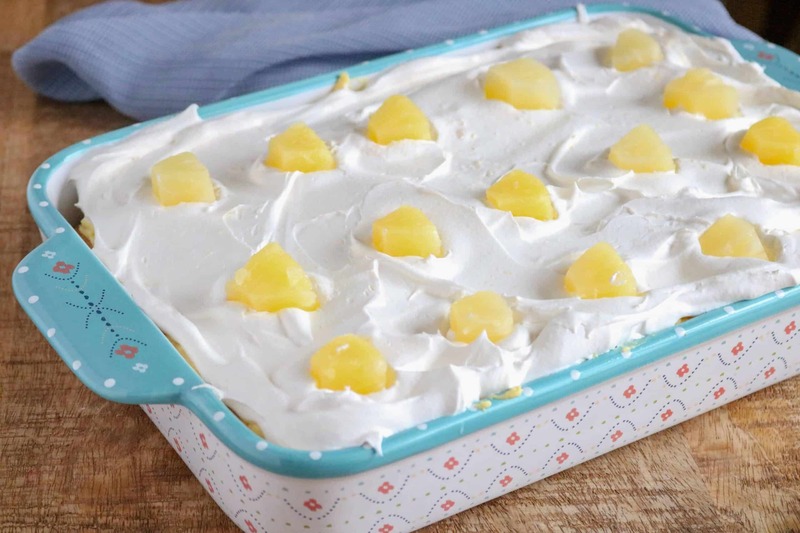 Top with whipped topping and pineapple chunks. Well, I think you’ve convinced me to try making a poke cake. I’ve eaten a lemon poke cake before that was amazing. I really like this version of a poke with you using the pineapple! It looks very flavorful! This looks so yummy! I will have to try this next weekend. Thanks for the invite! I just linked up a while ago. Made this so good!! We grow our own Pineapples, so I used them and substituted the Pineapple juice left for the 1/2 cup of water in the cake. I didn’t have vanilla pudding mix so used Lemon. I chunk the pineapple on the bottom and crushed the rest to sprinkle on the top. It was all gone in 15 mins. at our ladies meeting. Quick, easy to make and a hit anywhere.